While the nature and status of translators' work are changing due to technologisation and other factors, translation is acquiring a strategic function in organisations. The intercultural component of translation competence makes translators well positioned to play a key role in assuring quality in international corporate communications. But quality models envisage only restricted interactions between translators, clients and communications specialists. Moreover, evidence about translators' self-concepts shows them underequipped to adopt the roles that meaningful cooperation with corporate communications suggests. This chapter reports on a pilot study at the interface between translation and corporate communications in Switzerland. Presenting findings from a survey of translation and communications professionals, it reveals underdeveloped feedforward and feedback cultures and a translator self-concept that underplays the mediatory, advisory added value of human translation. Concrete implications for quality assurance and translator education are drawn and future research is outlined. This chapter addresses the hitherto untapped potential that exists between corporate communications on the one hand, and translation on the other. As international communication management gains growing momentum as a profession and discipline in its own right and as translation acquires an increasingly strategic function in organisations (Huck-Sandhu, 2015, 2016; Massardo, van der Meer, & Khalilov, 2016), the intercultural mediation inherent in translators’ work (Liddicoat, 2016) would seem to make them well positioned to play an integral part in assessing and assuring output quality in international, multilingual corporate communications. In view of the rapidly changing nature and status of translators’ work due to technologisation and other factors, a closer integration of translation in international, multilingual corporate communications should present translators with welcome professional opportunities. Yet, dedicated quality standards for translation service provision and other quality-assurance and quality-assessment models envisage only restricted interactions by means of feedforward and feedback between translation professionals, client organisations and the communications specialists who work for them. The term feedforward is applied here not simply in the sense, habitually used in the media and communication community, of “information about receivers that is available to the sender prior to communicating with them and that can be used to improve the effectiveness of the communication” (Chandler & Munday 2011), but in the more general sense of “the modification or control of a process using its anticipated results or effects” (feedforward, 2017). The present authors’ definition of feedback is similarly broad, namely “helpful information or criticism that is given to someone to say what can be done to improve a performance, product, etc.” (feedback, 2017). Moreover, evidence of translators’ professional self-concept (Katan, 2011, 2016), defined by Kiraly (1995, p. 100) as “the image of the translator’s social role, the translator’s appraisal of his or her competency for translating a particular text, and understanding of responsibility towards the other personalities in the translation context of situation (author, commissioner, user, and reader)”, suggests that most translators are not yet equipped to adopt the evaluative, advisory and (co-)creative roles that meaningful cooperation with corporate communications specialists would suggest. Against this background, the current chapter reports on a pilot study conducted by the authors at the interface between translation and corporate communications in Switzerland. 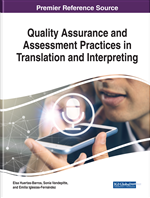 After setting out the backdrop to the study and describing its motivation and design, the chapter presents the detailed results of a questionnaire survey of translators, translation project managers and communications specialists. It then proceeds to discuss the implications of the findings for translation quality and translator education, finishing up with a brief consideration of prospects for future research.